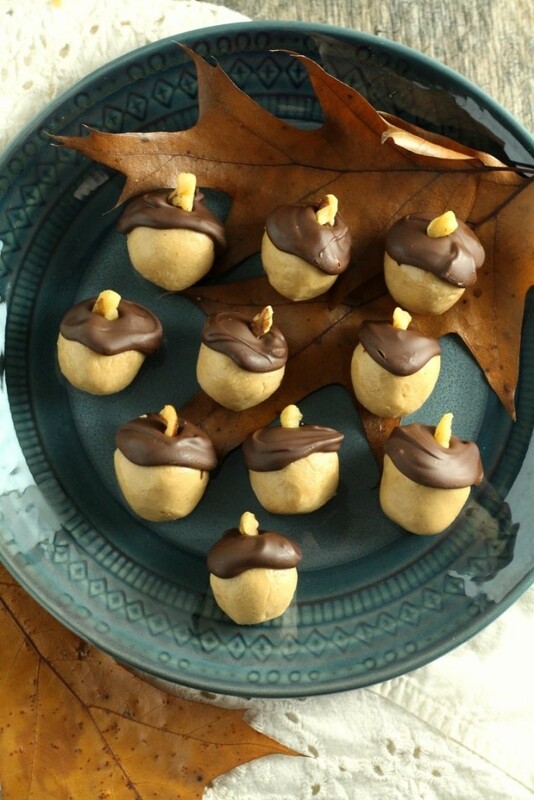 These chocolate peanut butter acorns are the cousin of everyone’s favorite buckeyes. 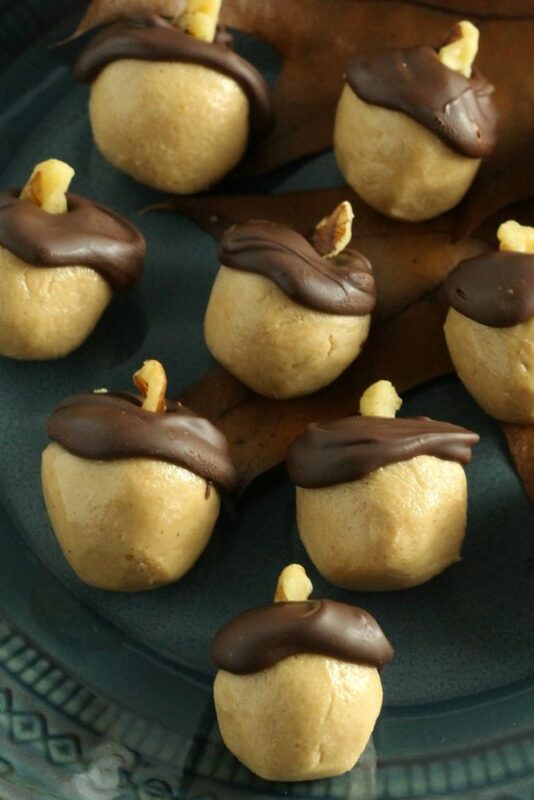 A smooth peanut butter ball topped with a chocolate cap and a walnut stem. 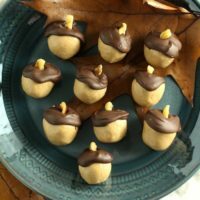 Just wanted to jump on here real fast while my children are napping and share these chocolate peanut butter acorns with you. These were a happy accident from earlier this week. I was making a new peanut butter chocolate treat for Christmas (can’t wait for December to share them with you), and I had some leftover peanut butter balls. I wanted to dip them in chocolate for us to enjoy now, but chocolate in the bowl was too low to dip them. So I just spooned some on top. As I was finishing, I noticed how much they looked like little acorns. I grabbed some walnut pieces from the freezer and gave them all a little stem. I had couple of recipe fails that day, so it made me happy that something worked out. These would be cute for kids for Thanksgiving dessert. Or adults too, because who doesn’t like chocolate peanut butter. I’m hoping to hop on here and share one more recipe before Thanksgiving, but with two littles, things don’t always go according to plan. Plus, we just bought a house and are moving soon! (More on that later). 🙂 But I wish you all a happy Thanksgiving! 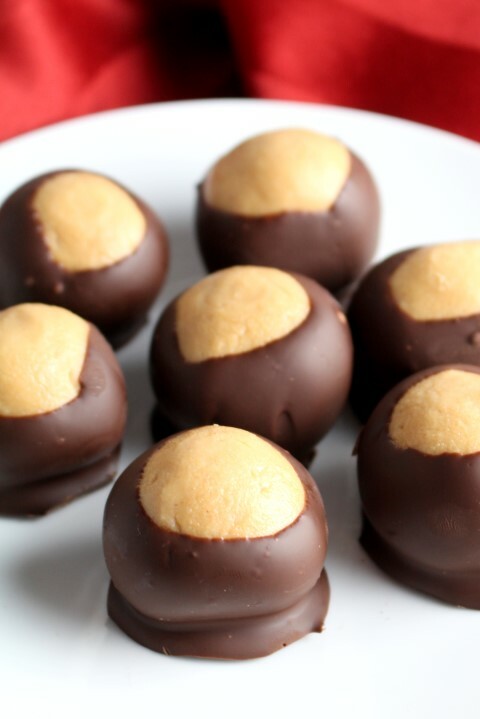 These chocolate peanut butter acorns are the cousin of everyone's favorite buckeyes. A smooth peanut butter ball topped with a chocolate cap and a walnut stem. In the bowl of a mixer, beat peanut butter and butter. Stir in vanilla. Add powdered sugar and beat on low speed until smooth. Roll into 1 inch balls and place in the freezer for at least 1 hour. Place the chocolate in a deep bowl and microwave for 10-15 seconds at a time, stirring between intervals, until melted. Spoon a little chocolate on the top of each peanut butter ball so they look like little "caps". Poke a walnut piece into the top of each acorn while still melted. Or if you’re looking for a grown up treat, you can’t beat these Pecan Pie Truffles from Glitter and Goulash.